Zakynthos is one of the most beautiful islands in the Ionian Sea and apart from its diverse natural beauty; it has a unique culture and rich cultural traditions. Folk singing, outdoor theatres, religious processions, folk festivals, carnival and many more traditions are still kept alive today by the people of Zakynthos. The district of Alykes has a strong cultural activity and in every village there is a cultural association. Meso Gerakario village - the Association "Anemogdouri"
Kato Gerakario village - the Association "the Evaggelistria"
The cultural associations work hard together with the community in the village to maintain the traditions of the island. Locals participate on special holidays and festivals in traditional music, 'Omilies' (satirical comedy plays) and much more and it is this effort that keeps the community spirit alive. 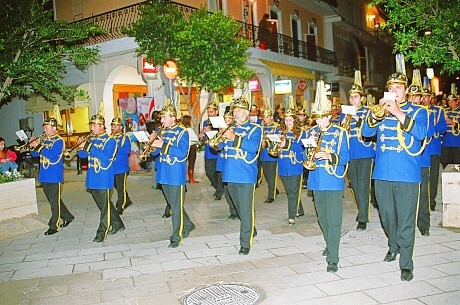 Also in the district of Alykes has one of the biggest bands in the Prefecture of Zakynthos, The Band of "Kostas Sampsarellos" whose members are local children and adults of the village.